Audio loopers are key to maintaining a clean signal path in a guitar rig that utilizes multiple effects products (like a board full of pedals). Rather than your guitar signal passing through multiple pedals, audio loopers let you place each of your effects into isolated audio loops, and if a pedal loop isn’t active, your signal never passes through the pedal. With memory to save presets, audio loopers also help you end the familiar pedalboard tap dance, since recalling a single program can enable or disable whichever audio loops you’d like instantly. There are many pedal audio loopers on the market, but none that we’ve seen quite as sophisticated as the Decibel Eleven Pedal Palette, which takes the familiar audio looper paradigm and turns it on its head. With the Pedal Palette, you can swap the order of your pedals in the audio loops on the fly, and it enables you to run effects either in series or parallel with each other. This clever audio routing capability earns the Pedal Palette a unique place in the floor-based looping category, and if you only need a handful of pedals in your setup (there are just four loops), you’ll definitely want to check out this supreme pedalboard audio looper. You’ll definitely see it on some of our pedalboards in the future. 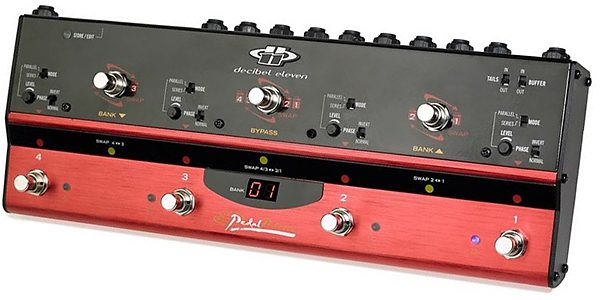 The Decibel Eleven Pedal Palette has four pedal loops with true-bypass switching. Typically, a switching system like this would have each audio loop wired in series, but the intelligent effects routing matrix in the Pedal Palette enables you to configure each loop to pass the signal through in series or in parallel, with a mix Level control adjustable independently for each loop running in parallel. In parallel mode, part of the audio signal goes from one loop into the next, but part of the audio also goes directly to the mixer and output stage of the Pedal Palette. The Level control lets you control the balance of how much of your effected sound runs in parallel to the series effect. This is useful for maintaining the quality of your tone, especially if you’re using any digital effects pedals, since part of your guitar signal will remain in a 100% analog signal path. There’s also a switch to invert the phase of the loop return when running in parallel. A Tails control lets you configure the loops so that when you step on a pedal to turn a loop off, the send to the loop is disengaged, but not the return. This enables your reverb tails and delay repeats to continue without being cut off abruptly. There’s also an onboard buffer that can be enabled or completely bypassed. The Decibel Eleven Pedal Palette contains memory to store 128 presets, arranged in thirty-two banks of four. Besides direct selection of the presets on the Pedal Palette, you can also use an external MIDI foot controller to make selections. MIDI functionality is basic. In addition to responding to Program Change messages, the Decibel Eleven Pedal Palette can also send MIDI Program Change messages that correspond to the preset being selected. A dedicated Tuner Out jack is provided, but there’s no footswitch available to mute the Pedal Palette during tuning. Housed in a rugged metal enclosure with Carling-style switches, the Decibel Eleven Pedal Palette was quite easy to operate given its advanced capabilities, but we needed to review the manual in order to make sense of some of the product operational features. We connected a few of our pedals to the audio loops in just a matter of minutes. All loops are connected internally, so there are no short jumper cables necessary to connect from one loop to the next. On each loop, we decided whether to run the signal in series to the next loop or parallel, and set a small switch as desired. The series/parallel decision can be influenced by many factors, including the type of effects you’re using and whether or not the Pedal Palette is going to run in your effects loop or in front of your amp. In the Pedal Palette’s Direct mode, you’re not dealing with saved/stored presets. You just step on loops to activate them. At a glance, you might not even notice the second row of footswitches, but those three switches enable swapping of your effects order. The first switch (from the right) swaps the order of Loop 1 and Loop 2, the third switch swaps Loop 3 and Loop 4, and the middle switch swaps the first two loops with the last two loops. In Preset mode (accessed by pressing a combination of two pedals on the unit), the LED display showed which bank of presets we were in, and the left and right loop sequence footswitches functioned as Bank Up and Bank Down buttons. We easily selected one of the four primary buttons to choose a preset within each bank. We liked that there were LEDs adjacent to the footswitches that showed which preset was selected, while the LEDs above the footswitch showed which loops were engaged. Individual level controls, along with recessed switches for series/parallel operation of each loop, and phase inversion switches, were easy to use and (thankfully) not easy to mess up inadvertently. The Decibel Eleven Pedal Palette was pedalboard friendly, running off of 9V or 12V at 300mA. We had no trouble ditching the included wall wart and powering it from a Decibel Eleven Hot Stone Deluxe power supply. Saving configurations of pedal loops was a simple task. All we had to do was enable the loops we wanted to use, hold the Store/Edit button, select a preset location, and hit the button again to write. Because the loops are all wired internally, there are no external break points if you want to run some effects pre-input stage and others in the loop. We either ran all of our effects in front of our amp or all in the effects loop. Yes, technically you can split the signal, but you’d lose two of the four loops in the process. Obviously then, our feature request would be to make this thing a little bit larger or just add a split point. Of course, with its MIDI capabilities, you could stick two of them on your pedalboard and have audio loop switching for effects throughout your rig, but that would take up a lot more real estate on your board, not to mention make a bigger dent in your wallet. The Pedal Palette is designed for your effects—not for changing channels on your amp, as some switching units are capable of. If you need that capability, you’ll need to investigate other looping/switching products. And finally, the tuner output works perfectly, but it lacks a method to mute your signal while tuning. We had to place our amp in standby to achieve silent tuning. The Decibel Eleven Pedal Palette sounds great, and its on-the-fly effects routing manipulation opens up a world of sonic exploration that has never been so easy to accomplish. Sure, you can experiment by patching pedals in random order by hand without an audio looper, but that isn’t nearly as spontaneous as stepping on a pedal to A/B the results of swapping your effects order. For players familiar with the Sound Sculpture Switchblade, the Pedal Palette delivers some of this device’s unique effects routing capabilities at a fraction of the cost, and without the need for a 19” rack! The Pedal Palette is silent in operation, though depending on how you configure some of the loops and the buffer setting, you might hear a click as a result of the true bypass signal path and the use of relays to accomplish loop switching. With the buffer engaged and a variety of pedals from Boss, Voodoo Lab, Morpheus, and TC Electronic, though, we didn’t experience any extraneous noise as a result of operation. Professional audio loopers maintain a transparent signal quality, and the Pedal Palette was every bit as quiet as any other pro looper that we’ve used. With independent level controls for each loop, we had no trouble matching levels across various pedals, and it worked well both in front of our amps and in our series-wired effects loops. Each loop also has a recessed switch that lets you reverse the signal polarity by 180 degrees. We didn’t need to utilize this with our pedals, but depending on the pedals in your collection, you might find this magic fix is just what you need when combining various modulation effects in your rig. Tip: Given the parallel mixing capabilities in the Pedal Palette, we strongly suggest using this in a series loop (or a parallel loop set to 100% wet) unless you’re running it in front of your amp. Running a parallel dry signal through your effects loop and through the Pedal Palette at the same time could wreck havoc with your tone. We loved the inclusion of a Tails Control feature. With parallel effects routing selected and the Tails switch engaged, our audio loops with delay and reverb pedals could be switched off without abruptly cutting off the reverb tails or delay repeats. The Decibel Eleven Pedal Palette includes a very comprehensive operation manual that thoroughly explains not just product operation, but also all about parallel/series effect processing in general, and there are numerous illustrations showing various ways to integrate the Pedal Palette into your rig. The Decibel Eleven Pedal Palette (MSRP $560) sells for approximately $400. This is a fantastic price for any audio looping product, and although there are only four audio loops in this device, the audio routing options are unparalleled to similar products. OVERALL RATING =3.7, which earns it a WIHO Award!